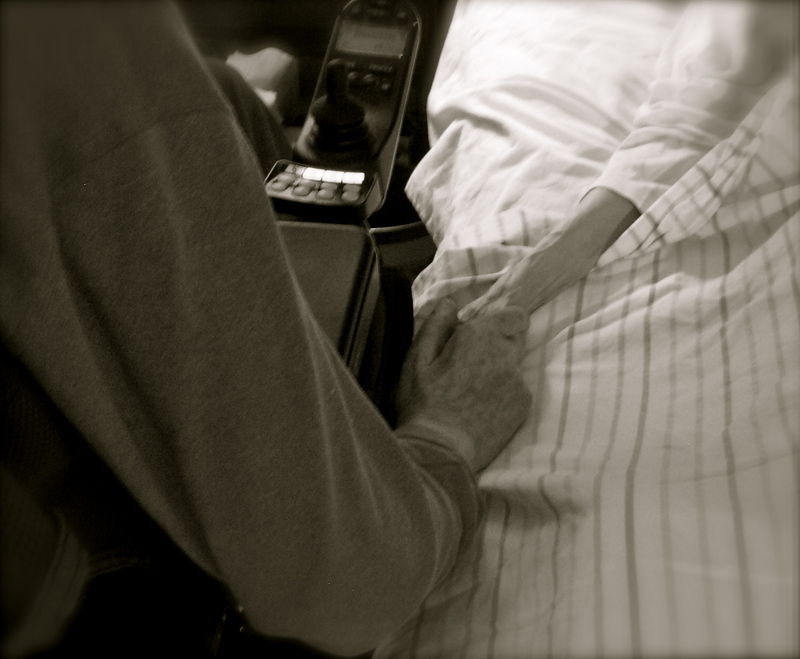 It has been a year, today, since you held Mother’s hand as her life slipped out of your reach. You have taken that empty hand, in the year since, and applied it to the pen, writing down to the the last word your 7th book in these five long years of crumbling health, calling it your last. That right hand is the only portion of your body that still can articulate itself, which I find a grace, for it delivers words which your tongue can not. Your fingers cannot make it up to the bridge of your nose to adjust your glasses, or across the plexiglass to turn a page of a book. But if a pen is laid across their crib, you still can press a word into the paper, like you pressed your aching heart into her hand. It is an amazement to see how much life is squeezed into what little you have left. When voice and movement and conversation are taken away, then, it seems, even more life comes flowing through the flesh of your palm. It ruffles the fur of a frisky friend, it strokes a baby’s leg, it empties the mind of its words onto paper, or sinks its feelings into another hand. When I think of all the channels still open to me – legs that can fly down my stairs, a voice that bellows in the car, hands that snap and clap – I feel as though a mighty river is over-running the sluices. And then I look at you, that one right hand left to carry all the force of being, and I am in wonder. How much it still has to say. How far it reaches. How deeply it has learned to love. ~ by Susan on 08/21/2013. Thanks so much for sharing words about your wonderful folks! I am so grateful that your dad still has this ability . . . He is such an eloquent (just as he is speaker; I choose not to use past tense), gifted writer. He has so much to offer, so I’m grateful that he is still able to share. I always look forward to reading your posts. My thoughts and prayers go out to your family. I think of Dr. Hull with a smile in my heart for the sweet twinkle in his eye. Your mom was an inspiration to us all. Please pass along my best wishes. What a beautiful photo and a beautiful letter, Susan. Makes me think of that song, “He’s got the whole world in his hand(s).” Your father certainly does. As your essays, letters, and reflections always do, this one grips my heart. I honor and admire your father and have since as a new faculty member, I listened to his sermon in the first fall convocation, 1987. it helped me understand a painful predicament through which my family and I were suffering. Where might I find a list of the seven books he has written since ALS took up residence in his body? I became acquainted with you, Susan, when I recommended you to the Provost–one Bill Hull–as a speaker during Women’s History Month at Samford in the early 1990’s. You preached a stirring sermon on Jephthah’s daughter. I am personally grateful to you now as I read your musings about your father and mother during their most trying times. Please give my love to Bill. I am holding him in The Light. I wish I had known your father, Susan, but meeting you in the past in Portland, and especially now, getting to know you a little more through your singularly moving writing, tells me something about him: he is extraordinarily rich in spirit and talent too, and generous in sharing both. Thank you! I went on amazon and could not find The Quest for a Good Death, A Christian Guide, not The Lord’s Prayer: Bringing Heaven and Earth Together by Bill Hull. Susan, On this sad day, I turned to your blog for comfort. Thank you. Our family will truly miss your Mom & Dad. Much love, Judy Mason.